Who said drinks and cemeteries don’t mix? Some of us served drinks at a cemetery on Tuesday. As part of their annual Solstice celebration, the beautiful Forest Hills Cemetery asked LUPEC to serve up a drink of our choice to some odd 250+ attendees. In honor of a Forest Hills “permanent resident”, Lucy Stone, we made Stone Rickeys, and the crowd ate ’em up (and we, er…ran out). Pour the gin, lime, orange, and simple syrup in a highball glass three-quarters filled with ice. Fill with club soda and stir. Garnish with mint or orange slice. The Stone Rickey was created by Dale DeGroff. The original Gin Rickey (a much drier drink with no sugar) took it’s name from “Colonel Joe” Rickey, a lobbyist in Washington in the late nineteenth century who regularly drank with members of Congress in Shoemaker’s Bar. Colonel Joe also became, interestingly enough, the first major importer of limes to this country. The early Rickey recipe first appeared in Modern Mixed Drinks, by George Kappeler, in 1900. According to DeGroff, the expression “stone” or “California Sour” has come to mean a sour with orange juice added. The Stone Rickey recipe listed here has been adapted by LUPEC Boston (less sweet, less orange, as noted by *) to suit our tastes and to fit the more austere spirit of the revolutionary Ms. Stone. 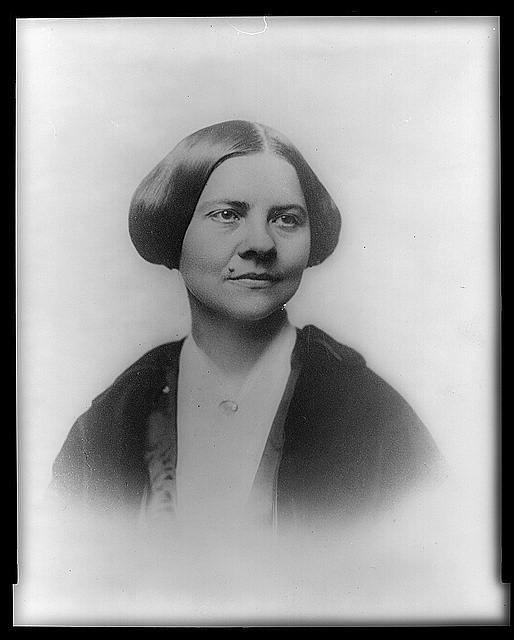 Lucy Stone was a pioneering suffragist and abolitionist. She was the first Mass. woman to earn a college degree, and the first in the United States to keep her name after marriage (thus the coining of the term “Lucy Stoners” for those who did the same.) She was a leader in organizing the first national woman’s rights convention, held in Worcester, Mass. The speech she delievered there is said to have converted Susan B. Anthony to the suffrage cause… She worked as an organizer and speaker for the American Anti-Slavery Society, and through this included radical speeches on women’s rights. Apparently not content to settle for all the aformentioned “firsts”, Stone went on and became the first woman in New England ever to be cremated. If you checked out our column in the Dig this week, you know LUPEC is already gearing up for the Tales of the Cocktail in July. Boston was well-represented last year, and if you haven’t booked your summer vacation yet, or are just looking to add a little additional fun to the mix this season, we suggest you consider making the trip down to NOLA this July. Yes, we know it’s hot, but the backwards nature of making a trip to the swampy south in the summer heat means that airline tickets (JetBlue flies direct) and hotel rooms are cheap cheap cheap. If you act now (or by June 16), you can also enter to win a free trip from Luxury Experience Magazine. Now that we’ve got you there, however will you make it through this madness? As we discussed in the Dig, booze flows all day long at Tales, starting with your first seminars of the day, which begin at 10:30 a.m., and continuing long into the night. When you find yourself at the bar yukking it up with the other cocktail aficionados in town for the event, low-alcohol sips are a great way to ensure you make it through. The Half-Sinner, Half-Saint (pictured right) is a go-to for many. If looking to take a momentary break from cocktails, switching to a lower alcohol sparkler like Moscato d’Asti can do the trick. Pairing your favorite liqueur (St-Germain, Velvet Falernum) or aromatized wine (Lillet or Dubonnet), with a little soda and a splash of citrus can work wonders. Or try any of these. Shake with ice; strain into a chilled cocktail glass. Garnish with a cherry. Build over ice in a highball glass. Garnish with an orange twist. Stir well with ice. Strain into a chilled cocktail glass and garnish with a cherry.